Ready to take the plunge with ProLon? Buy your package from us online, and we’ll have it shipped (free!) directly to your home. Two decades of scientific discoveries from the University of Southern California brings you an easy-to-use, 5-day meal program. ProLon has been shown to provide protective, regenerative and rejuvenating effects, while providing balanced nourishment. ProLon’s Fasting Mimicking Diet™, or FMD, is proven to promote longevity, overall health and reduce excess fat, all while promoting regenerative and rejuvenating changes to the body. The FMD is most effective when used for a period of only 5 days, allowing you the freedom to live your regular lifestyle. The FMD is the first and only meal program that provides the body with optimal nourishment made up of healthy, natural ingredients that someone consumes for 5 days. This keeps the body in a fasting mode. In simple terms, it is fasting with food! Want to know if ProLon is right for you? Contact us today to find out. 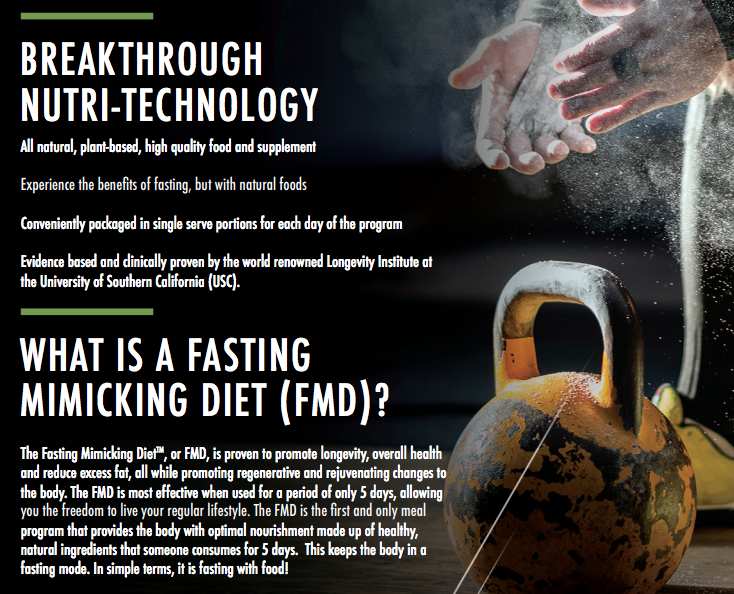 The 5 Day Fasting Mimicking Diet™, or FMD, is the first meal program made of healthy natural ingredients that is consumed for five days – but is not recognized by the body as food. This keeps the body in a fasting mode. In simple terms, it is fasting with food! The Fasting Mimicking Diet is proven to promote longevity, overall health, and reduce excess fat in just 5 days… allowing you the freedom to return to your regular lifestyle. why is fasting so beneficial? ProLon’s fasting with food meal plan is low in carbohydrates and proteins and contains good fatty acids. The ProLon® FMD patented recipe allows your body to trigger a set of protectionist measures that the body developed during natural selection, when food was scarce and not easy to find and store. It allows your body to optimize its performance, rejuvenate its cells, and thrive under such circumstances. When tested in mice, FMD’s increased their median Healthspan (healthy years) by a striking 11%, and in randomized human trials it normalized many metabolic health metrics that are correlated with aging and healthspan.